Random And Some: Sir Yes Sir! 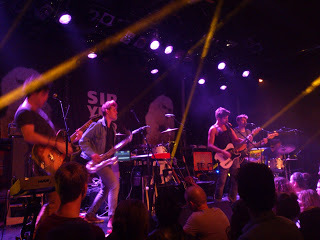 I recently attended a Sir Yes Sir gig at Jour Tibour. I had heard about the Tijs Delbeke-led 5-man collective on now-suspended current affairs program De Kruitfabriek in February, but I had not yet familiarized with their music. Even though it rained, and most people took shelter under the trees, Sir Yes Sir gave a great performance: their songs are mature and multi-layered, the inclusion of the saxophone is awesome, and you should definitely check out their debut album We Should Talk.